Summer is in sweaty swing and the garden accompanies that dance with a blooming boogie-woogie. 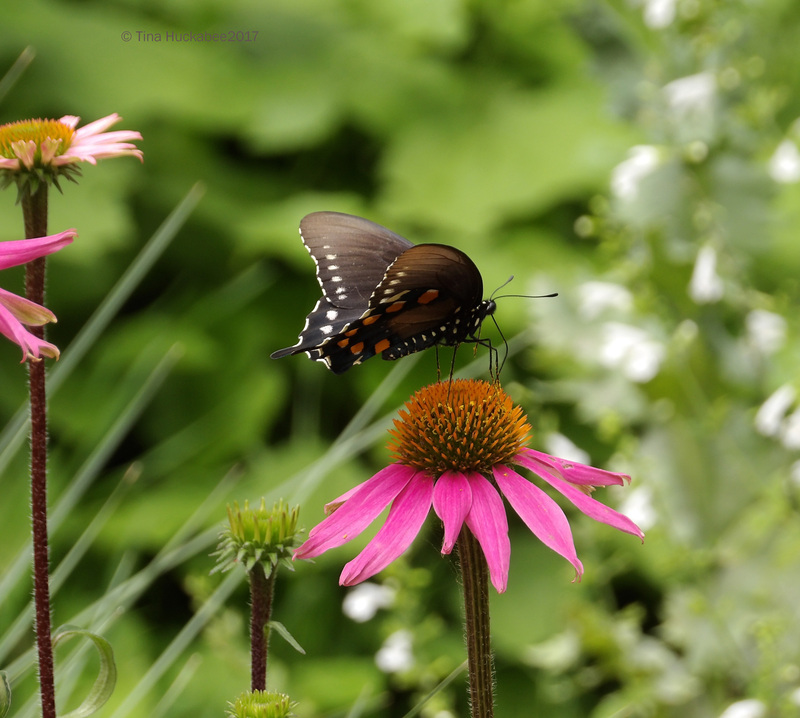 Wildlife rely on the warm season’s bounty of summer flowers and resulting seeds and fruits. In addition to contributing to plant procreation and augmenting biological diversity, these wild critters–winged, feathered, furred, and scaled–add beauty, complexity, and life to the garden. 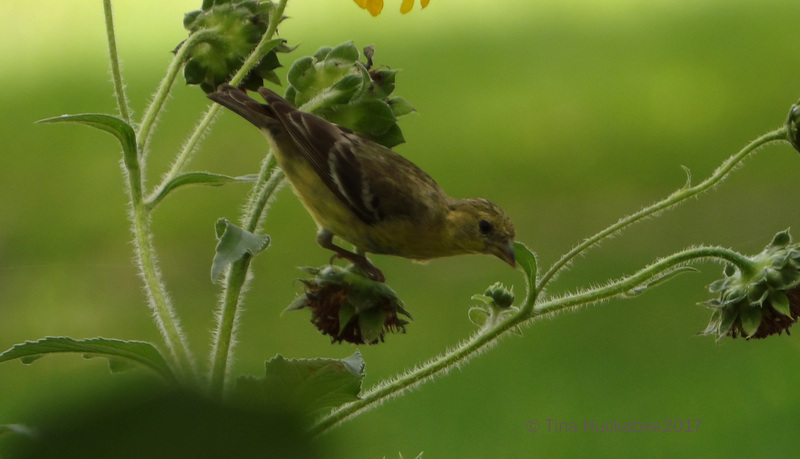 Welcome to my garden and to Wildlife Wednesday for July! Due to some travel and other distractions, I missed posting during the annual celebration of pollinators (Pollinator Week, June 19-25), but my garden certainly enjoyed its share of pollination pow-wow this past month. 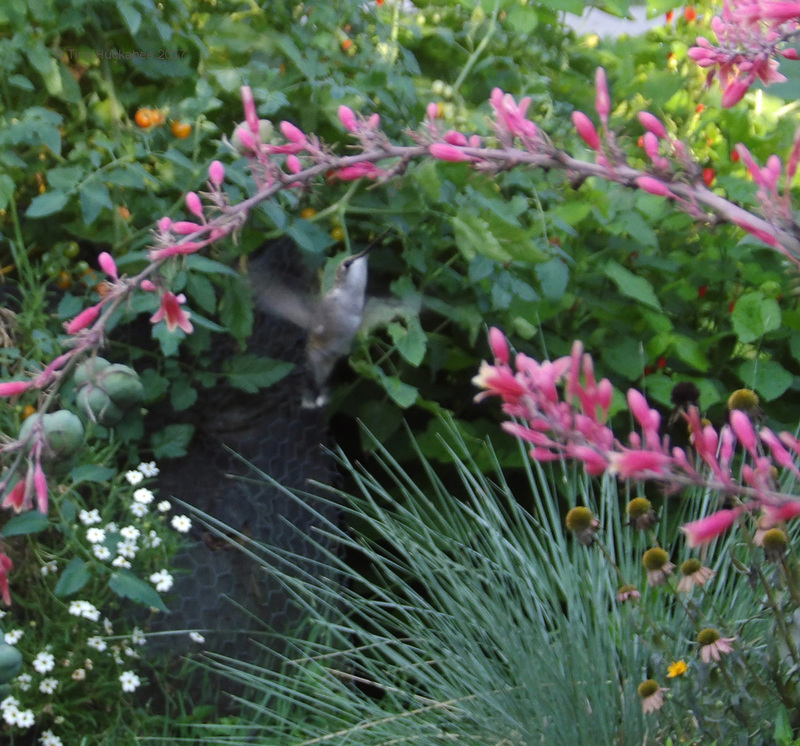 This is the best photo I’ve snagged of nectaring hummers. I see at least one daily, but rarely have the camera at hand for a shot. This little beauty slurps sweetness from salmon blooms of a Red yucca, Hesperaloe parviflora. I’m fairly sure that this female is a Black-chinned Hummingbird, Archilochus alexandri. There are at least two females currently visiting and I’ve also spied a male Black-chinned. Butterflies ramped-up their presence in May and June, though recently I’ve only seen the smaller butterflies in my garden. In the following photos, do you detect a theme? 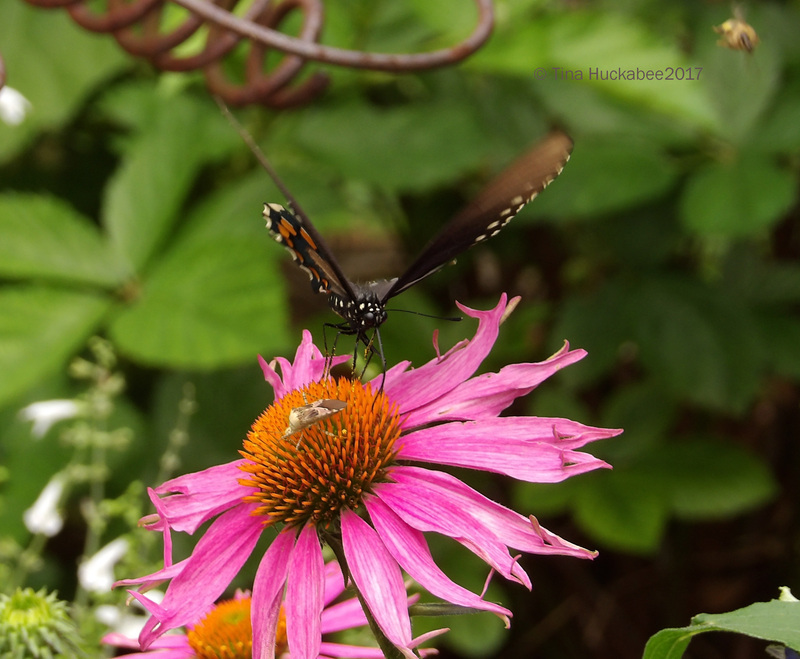 Purple coneflowers are boss pollinator plants. 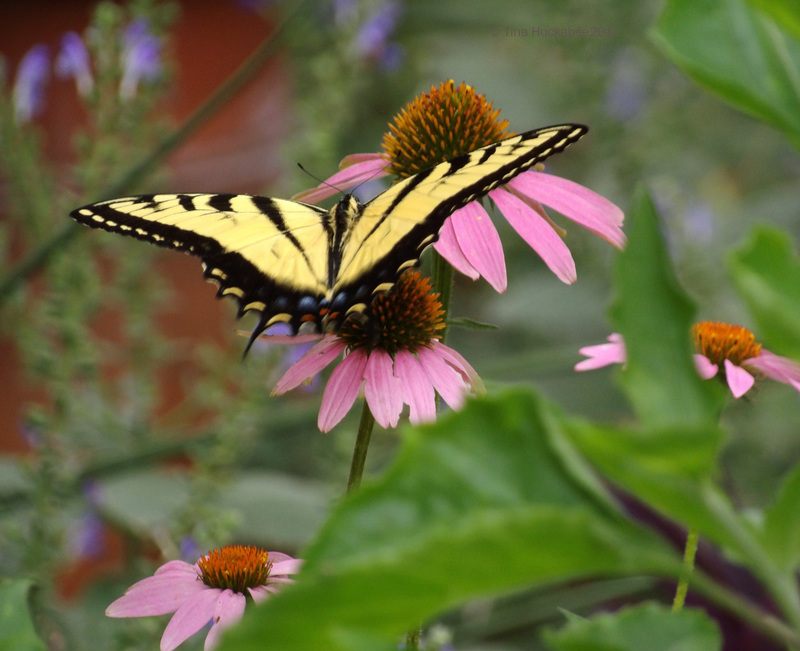 No pollinator garden should be without a few of these North American native flowers. If you plant them, they will come. Evidence of a butterfly life cycle is apparent on the foliage of Zexmenia, Wedelia acapulcensis var. hispida. Nourishing larvae of the Bordered Patch butterfly, Chlosyne lacinia, Zexmenia–like most native plants–provides a food cart whammy: the leaves are sustenance for the host-specific butterfly caterpillars; the flowers provide nectar and pollen for a variety of pollinators. Additionally, Zexmenia also feeds finches, warblers, and sparrows once the flowers go to seed. Zexmenia is a powerhouse wildlife plant. The cheery daisies of Zexmenia are nice for adult pollinators, but caterpillars adore the leaves. 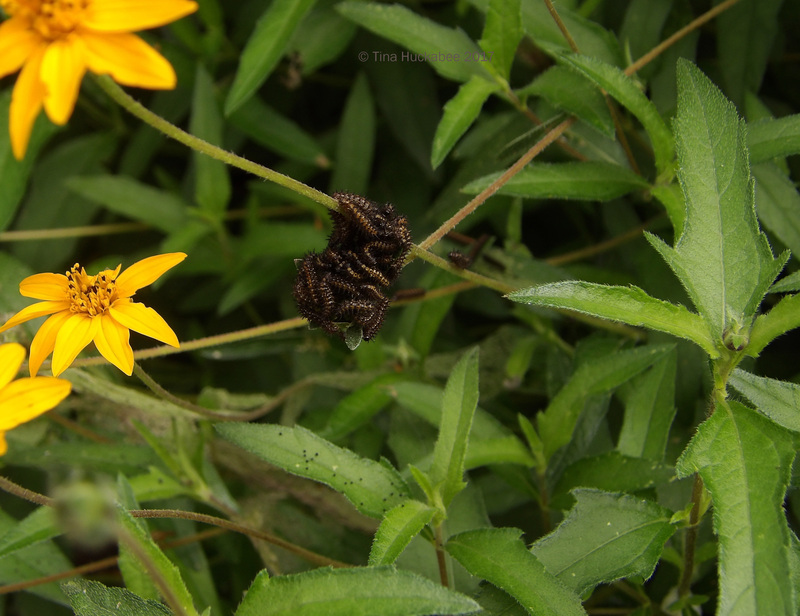 Check out the caterpillar poop sprinkled on the leaves just below the clump of cats. Everybody poops! Butterflies are important pollinators and beautiful to behold. To attract butterflies and moths to your garden, you must provide host plants, which attract specific butterfly species, so that the larvae, or caterpillars, can eat, grow and morph to their adult winged stage that we all desire for our gardens. Tolerance for munched leaves is a must when seeking to promote a healthy and diverse garden environment. 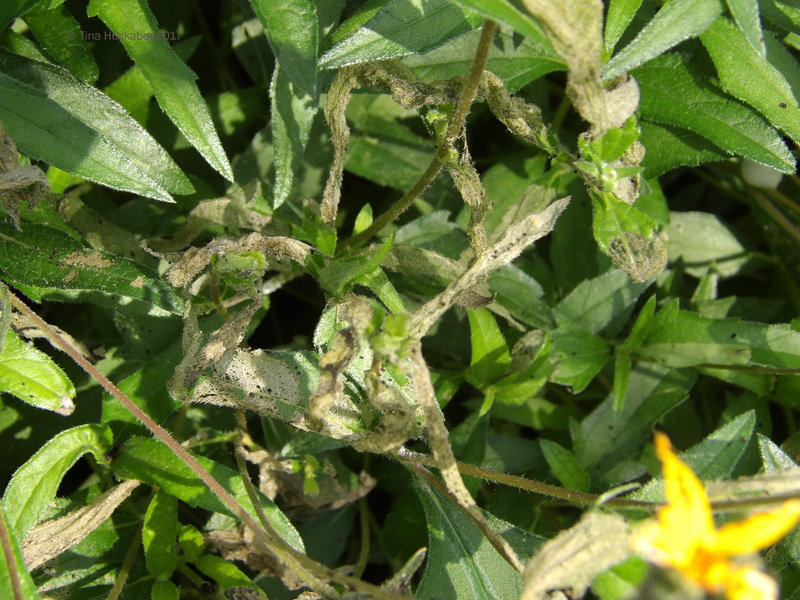 Caterpillars generally do little serious damage to foliage. Rather than engaging in chemical warfare at the first sign of foliage problems or gooey caterpillars wiggling on leaves, it’s best to observe who’s eating what in the garden, as most insects are beneficial and not harmful to landscape plants. If you (or your neighbors) spray insecticides (even those labeled organic or natural), beneficial insects will be collateral damage. Insecticides don’t discriminate: they kill all insects, not just those targeted. A live-and-let-live attitude is useful for a wildlife gardener and the minimal damage from desired insects is usually short-lived: the compromised leaves slough off and new foliage grows in place, ready for a new cycle of life. 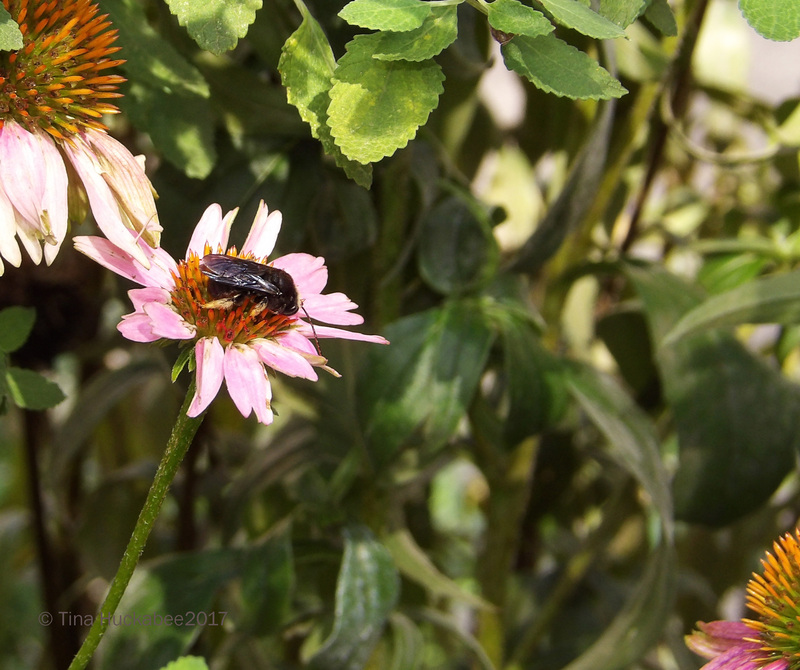 I’ve seen this bee on occasion and it’s usually on Purple coneflowers; I assumed it was some sort of carpenter bee. I use several local native bee resources for identification when I spot an unrecognized bee, but have never figured out just what kind of bee this industrious worker is–until recently. I uploaded this photo to BugGuide.net and a nice, insect-loving bug guide pegged this yellow-legged critter as a Two-spotted Lorn-horned Bee, Melissodes bimaculatus. So now I know! The Two-spotted belongs in the grouping of bees (like bumbles and miners) which are ground nesters, but I don’t know if that holds for this one. I’m glad to see him–the BugGuide person said the bee was a him–I didn’t peek. Regardless of gender identification, this dude and his girlfriends are welcome to my coneflowers anytime. My favorite native bee is the Horsefly-like Carpenter bee, Xylocopa tabaniformis, and there are plenty of them in my garden this summer. …and another at an Autumn sage (Salvia greggii). Strictly speaking, this bee is nectar stealing and not contacting the reproductive organs of the flower, therefore, no pollination. But, I won’t quibble too much, I’m certain this bee pollinates, even if he/she is cheating at this particular moment. I provide wood for these cuties throughout my gardens for their drilling and nesting pleasure and am rewarded with pollination action galore, as well as delighting in the charm of their dreamy blue eyes and groovy racing stripes. 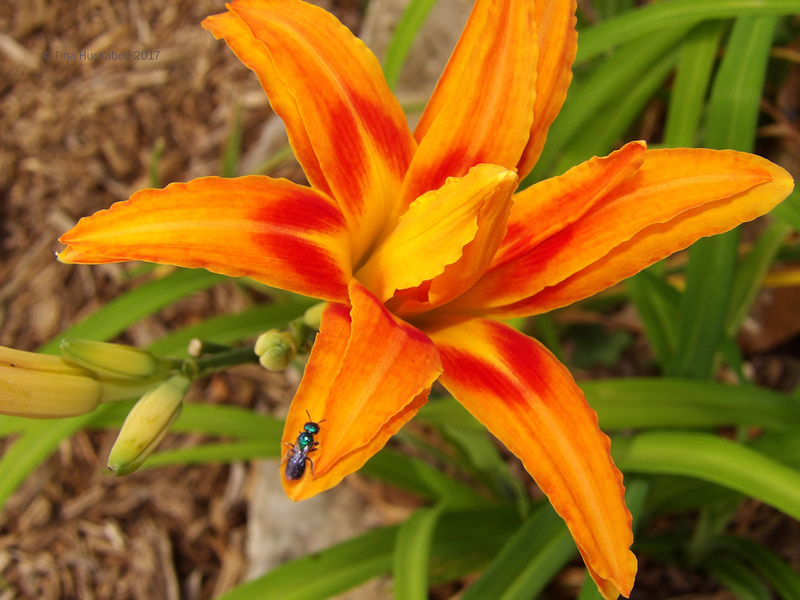 I missed most of the short bloom time of my orange passalong daylilies because of travel, but was fortunate to catch some of its loveliness, along with the gorgeous metallic native bees who also appreciate these flowers’ orange goodness. Look at the pollen gathered on this little bee. This shiny pretty is probably a Sweat bee, Augochloropsis metallica. 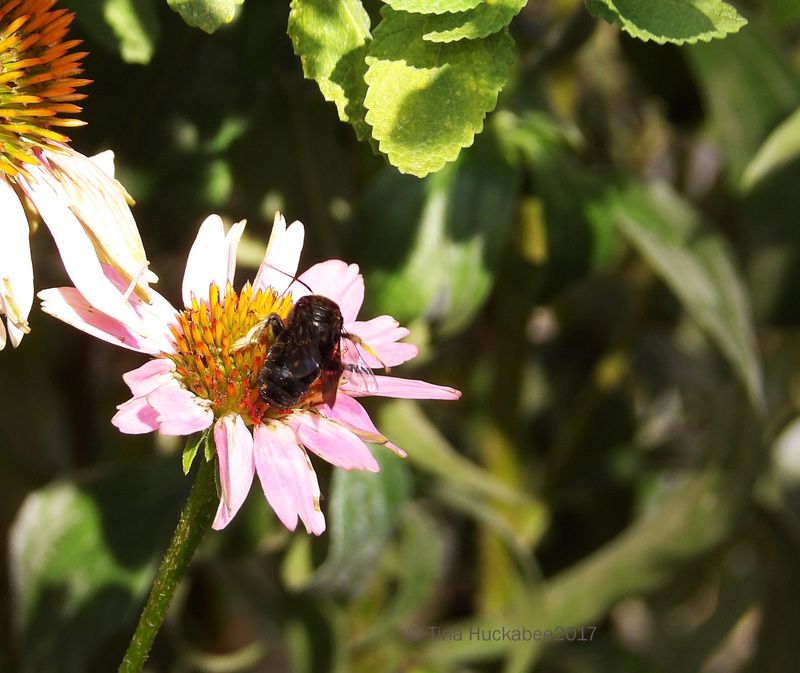 These bees are common in my garden; I’ve noticed that they prefer flowers in the red-to-orange color range. 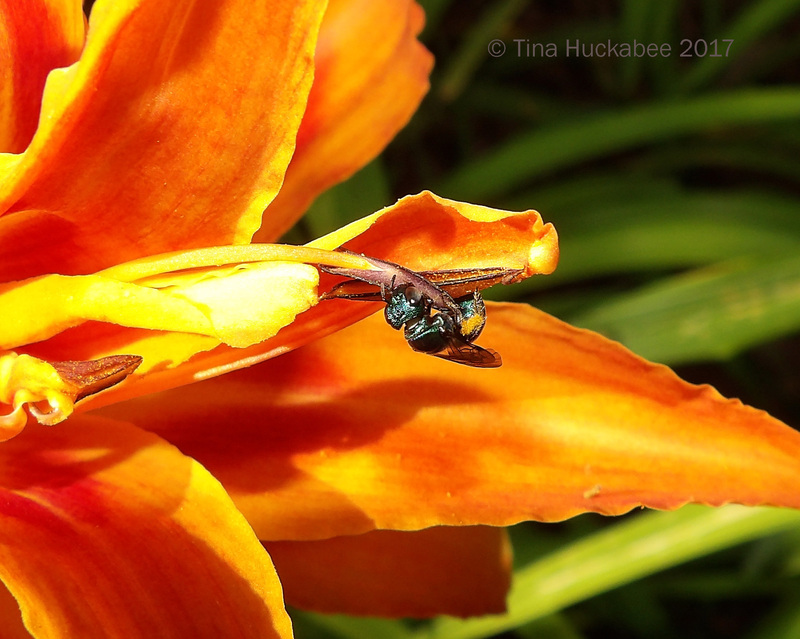 While the daylilies were blooming, and if I was out before their petals unfurled for the day, I’d see these bees buzzing around the blooms, seemingly impatient for their breakfast spots to open for business! Another native bee species active this past month are these tiny critters, probably one of the carpenter bees, Ceratina sp. 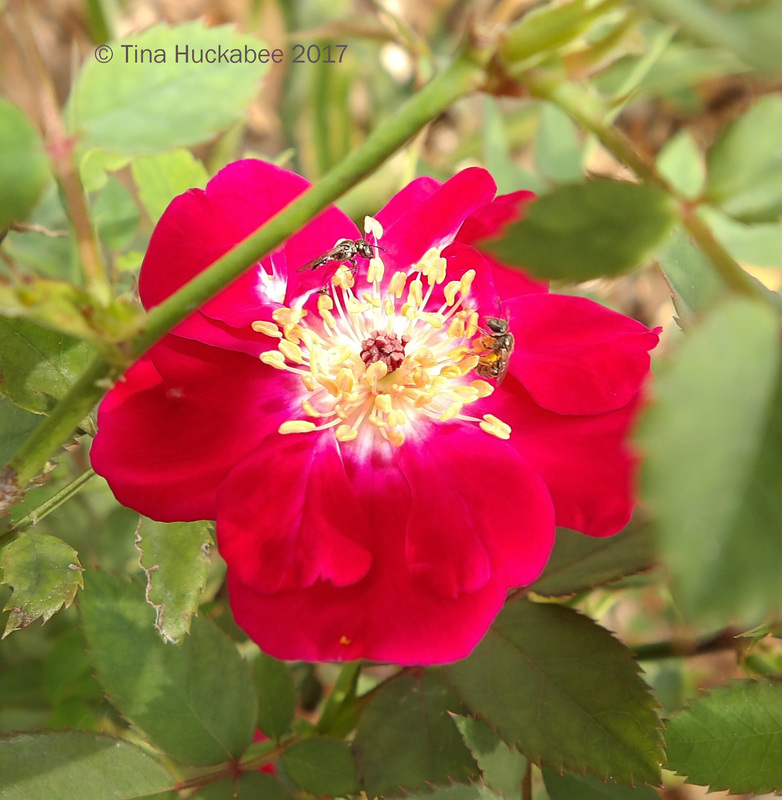 These two work the pollen of a Martha Gonzales rose. The one to the right holds quite a load of pollen. These itty bitty pollinators enjoy a variety of blooms, native and non-native alike. I searched several databases (local to Texas) and concluded that this was likely a kind of ‘underwing’ moth, but as I perused photos, I couldn’t find an exact match. I uploaded this photo to Butterflies and Moths of North America, and received a confirmation ID of a Agrippina Underwing, Catocala agrippina. The moth’s obvious beauty aside, my photo is one of five verified sightings of this moth. Woot! 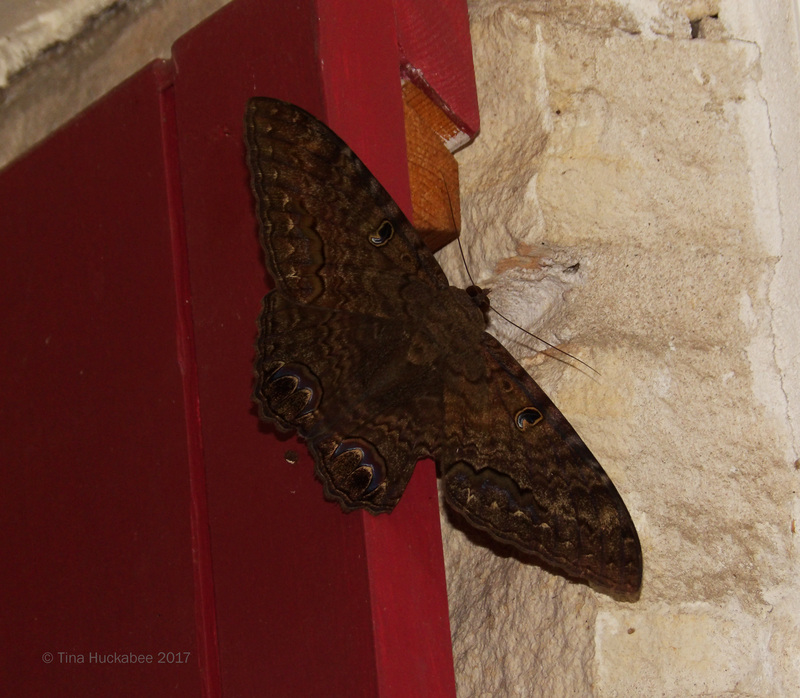 Another gorgeous moth who chose a window shutter as his resting spot was this Black Witch moth, Ascalapha odorata. 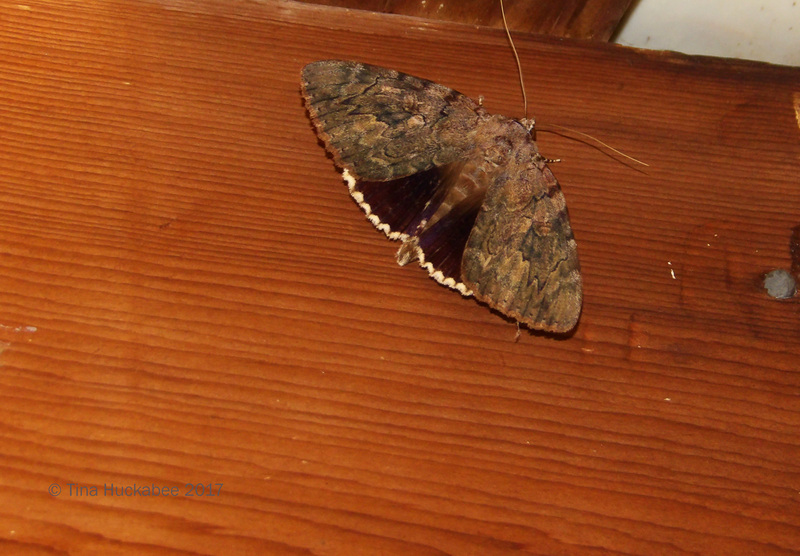 The moth’s wing-span is about four inches and you can see that a bit of one fore-wing looks like it was nipped. This handsome moth is a male, as the females have pink bands along the fore and hind-wings, which this fella lacks. 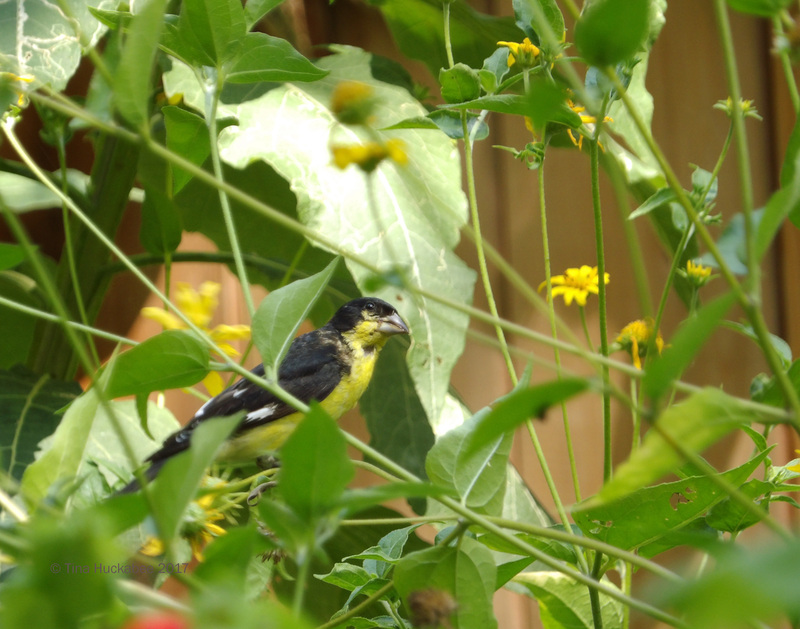 Pollinators rule the summer garden, but you know I’m going to profile a few birds for Wildlife Wednesday, right? 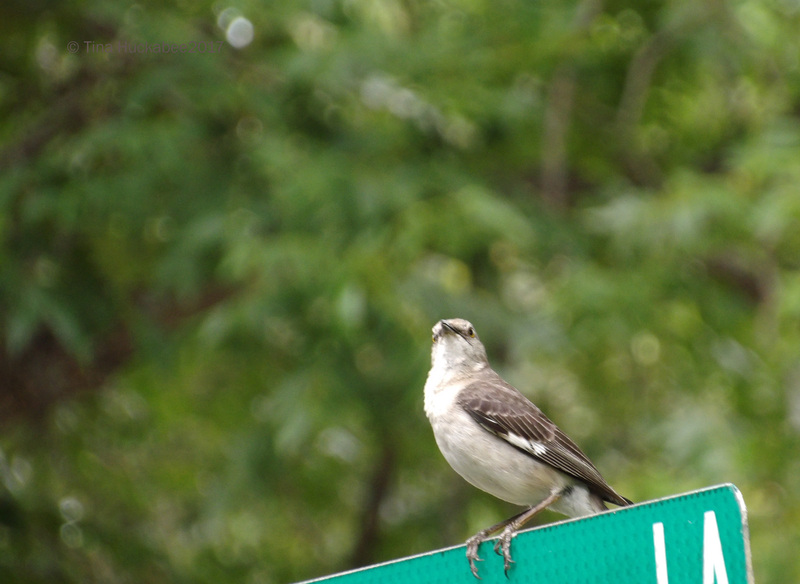 Surveying his realm atop the street sign, this Northern Mockingbird, Mimus polyglottos, often serenades me when I’m in the front garden. 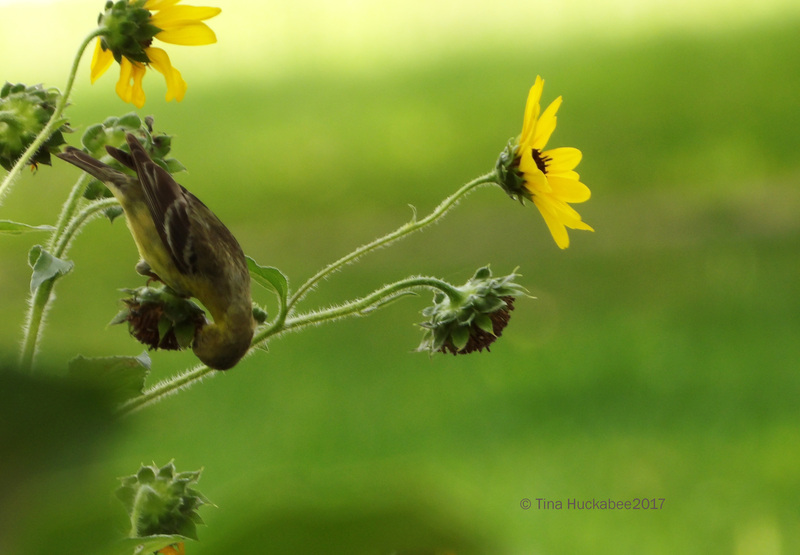 As the sunflowers, Plateau goldeneye, Zexmenia, and Purple coneflowers go to seed, Lesser Goldfinch, Spinus psaltria, show up for the seed buffet. Acrobatic little birds, they often dine, upended. She’s wary as I move closer. Mama Eastern fox squirrel, Sciurus niger, regularly thieves commercial sunflower seeds that I set out for birds, though I suppose I set the seeds out for her too, since I don’t prevent her from eating. She’s quite an adept high-wire artist, balancing along the wire that the bird feeder hangs from and skittering, unerringly, to the roof of the house whenever I step outside. If you don’t have wildlife in your garden, it’s easy to plant for them and provide a welcoming home: they’re entertaining, beautiful, and necessary for a well-rounded garden. If you do have wildlife, please post for July Wildlife Wednesday. Share photos and stories of your garden wildlife; promote and appreciate your region’s natural habitat and diversity. When you comment on my post, please remember to leave a link to your Wildlife Wednesday post so readers can enjoy a variety of garden wildlife observations. 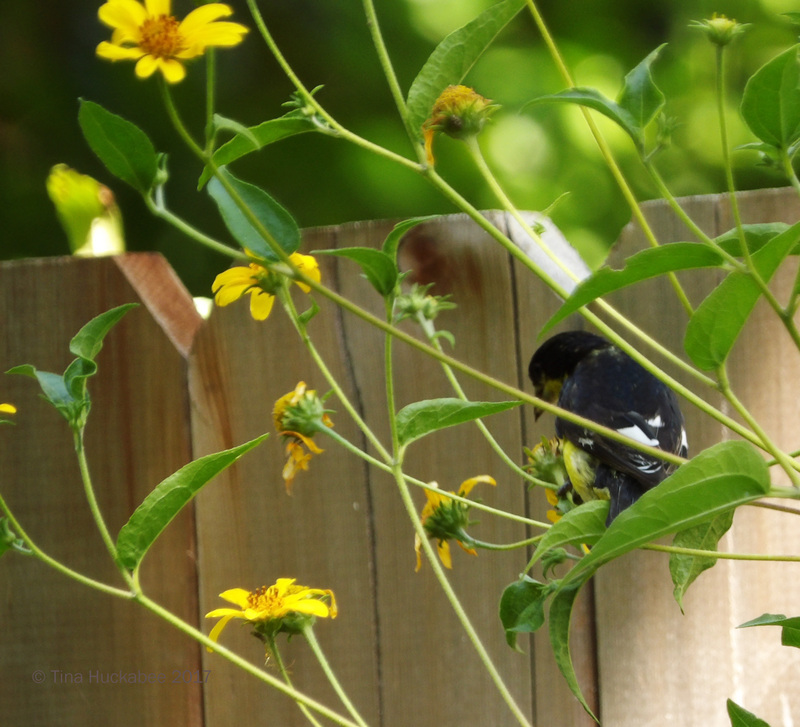 This entry was posted in Uncategorized, Wildlife food, Wildlife Gardening, Wildlife Gardening in Ausin, Wildlife Habitat, Wildlife Wednesday and tagged National Wildlife Federation by Tina. Bookmark the permalink. I enjoyed this visit to your garden. Lovely. I’m glad you stopped by for a visit! How lovely to be visited by real humming birds rather than moths (even if your moths are pretty spectacular)! Isn’t the black swallowtail is a classy looking butterfly? Echinacea is a big pollinator attractor here too, but today I’ve been impressed by how many bees and hoverflies can make use of a teasel flower at once (about 20 by my count). I’ve really enjoyed the hummers this season. Typically, I don’t see much action until August-September, but the two females that are regular visitors must have nests nearby, I wish I knew where. Echinacea really are some of the best feeders, but I’m impressed with your teasel flower–wow! 20! Nice post and very educational. I garden the same as you, strictly organic. I would not garden any other way. The photos are really good. I cringe when I see folks lugging gallons of Round-up and the like. If just a little bit of thought would go into garden planning, none(or significantly less) of that junk would be necessary. Sigh. 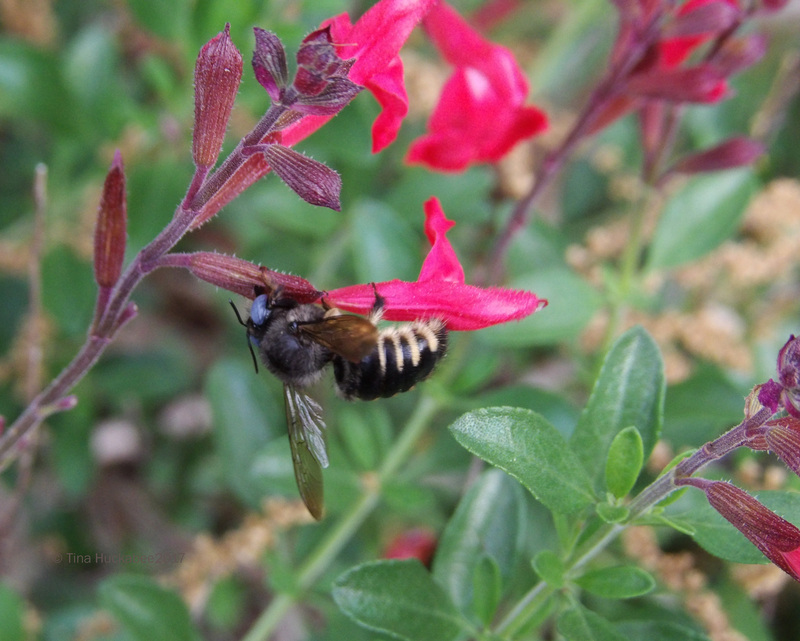 There are about 350 native bee species just in Texas! I’m fortunate to have ID’d 14 or 15 in the past year in my garden. Yes, you are correct about insecticides negatively impacting not just the insects, but all of those other critters who feed on them. Beautiful butterflies in your garden, I’m still wondering where they all went this year since I usually see so many. I’ve killed far too many purple coneflowers yet your post convinces me I should try again. You do take the most fabulous photos, Tina. And offer great advice too. Live and let live – I like that! I’m glad you like the squirrels, Sue. Lots of folks around here get really annoyed with them, but I’ve always been charmed by their intelligence and humor. I’ve enjoyed learning about our various native bees and am glad they have a home (or at least, meals) here. You have made me aware of the many kinds of bees there are out there. I have not identified them, but I have noticed a variety in my garden. This year, I am finally seeing more butterflies. Do you know if wasps or other insects eat Monarch eggs? They seem to be laying them, but I am not seeing caterpillars. A follow up to my Disney Gingers, after checking for weeks, I have not seen a single pollinator on them. 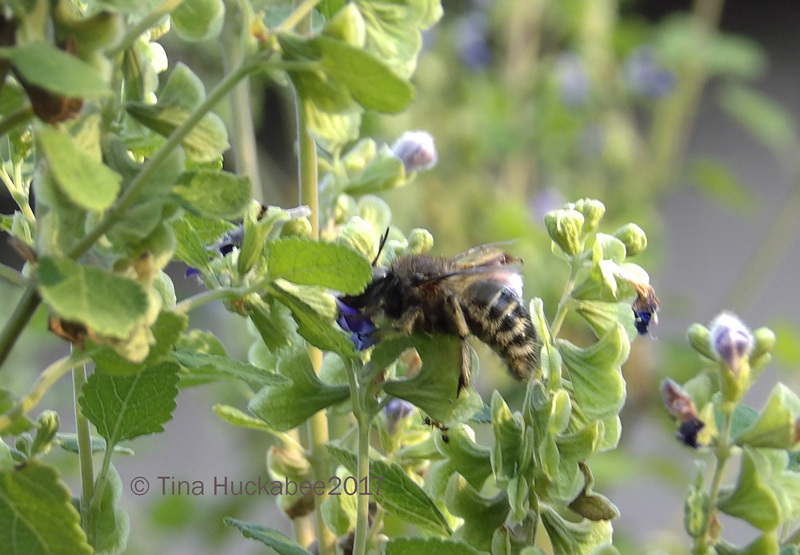 It’s amazing just how many different bee species there are–it’s just about planting for them and then noticing them. Glad you’re having more butterflies, mine are mostly the little skippers–so hard to photograph, though. Yes, I believe there are wasps who paratisize all kinds of eggs, probably Monarchs included, though I don’t know that for certain. I’m not sure you would have Monarchs now, though; could they be Queens? I will take a closer look. Do the Queens lay on milkweed, too? I’ve completely failed to participate this season in the wildlife meme, so it’s good to see the other ones keeping up with the task! Thanks and really, no worries. This is supposed to be fun, not stress-inducing! Those coneflowers really are a draw, aren’t they? I noticed the same thing with the basket-flowers. They were hosting several kinds of bees, some flies, butterflies, and an assortment of bugs, including the leaf-footed. Even the ladies’ tresses orchids were visited by big bees this year — some I’d thought would be too big and heavy for those delicate orchids, but they clearly knew their business. On the same day I found the yellow rain lily, I found this beauty in the grass. After studying the site you linked, I decided it’s a female queen butterfly. What say you? A-plus for butterfly ID! Yes, it’s a girl one, not a boy one–Monarchs are the same with the black spots on the guys and none on the gals. I love to watch those various blooms which appear to attract everyone. It’s amazing that there aren’t more pollinator crashes around those plants! Wonderful tub post. Butterflies, Bees, Birds, Moths and precious flowers. 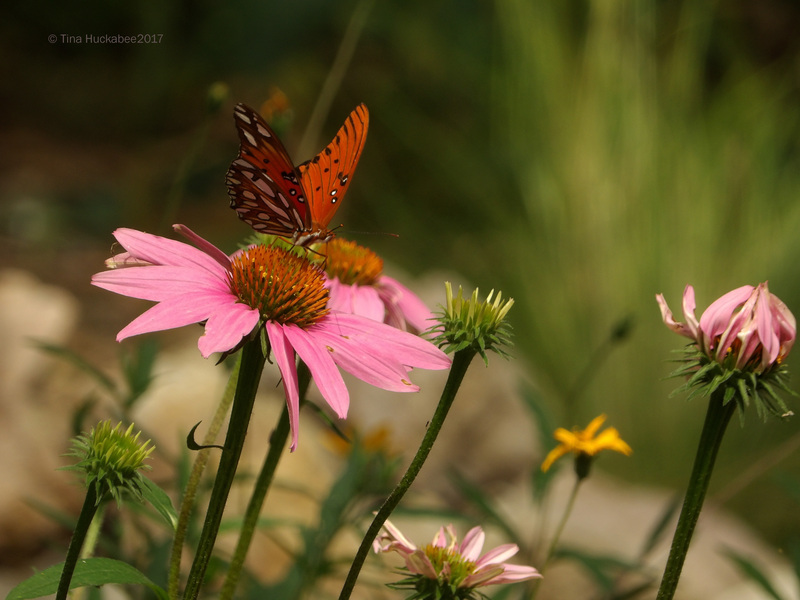 Purple Coneflowers are the kings of pollination and very beautiful. 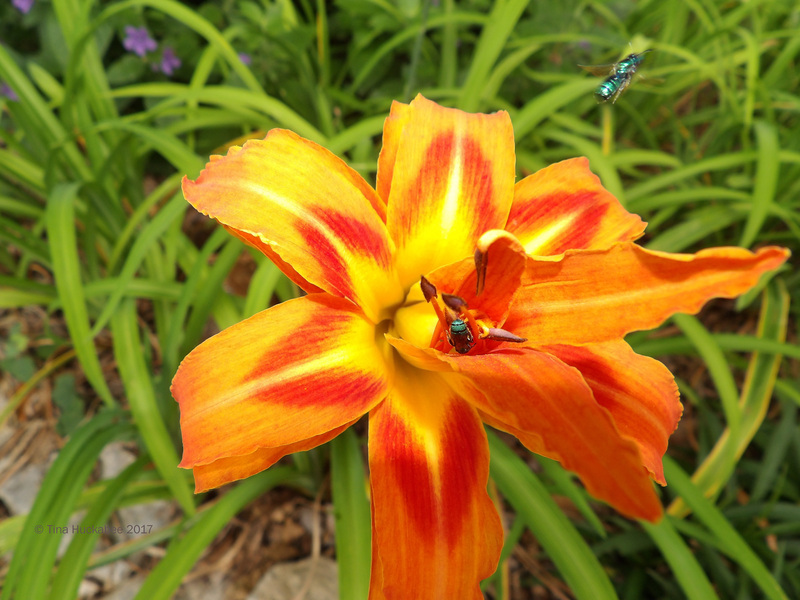 The Daylilies are beautiful with the sweaty bee eating. The black witch moth enchants me. The smaller Goldfinch eating upside down is gorgeous. 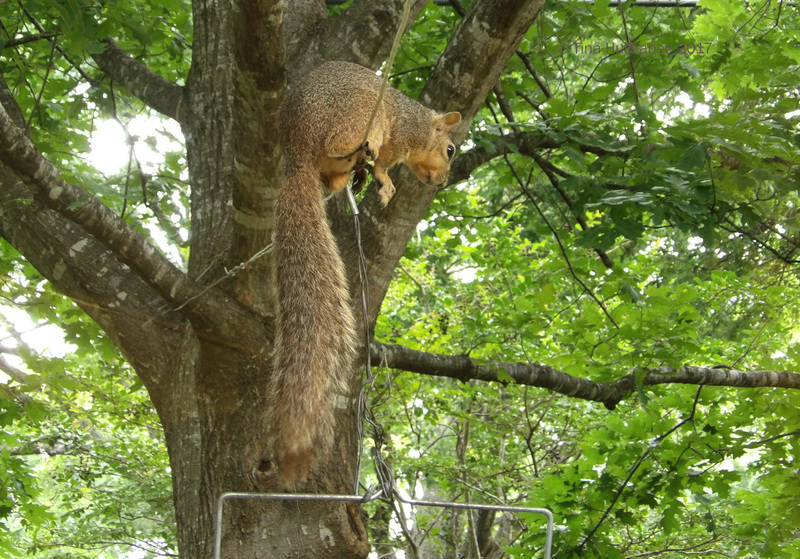 Mama Eastern fox squirrel is amazing. Thank you very much for the walk through your beautiful garden. Wildlife forever. Greetings from Margarita. Good to hear from you, Margarita! Thanks–I’ve enjoyed what grows in my garden and enjoy even more, those who visit! Wow, so many great photographs, especially the butterflies. I think we have carpenter bees in our garden as well. They are in the habit of getting at nectar by biting the ends off the tubes of the Monarda flowers. Thanks! Yes, those carpenter bees are notorious nectar thieves.